Will any of tonight's drafted players unseat one of the names on this list? 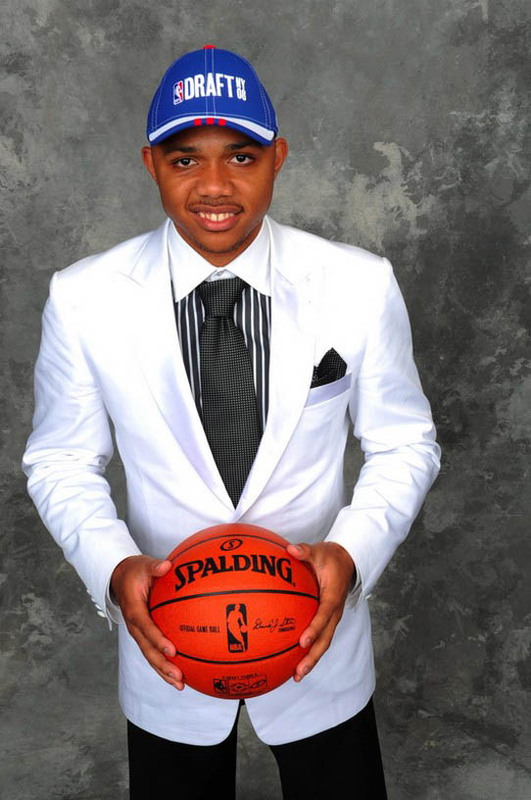 Check out the worst draft suits ahead since the lottery began. 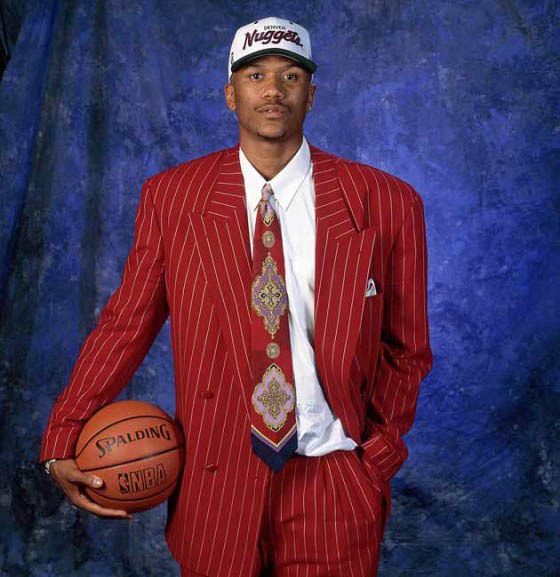 It's draft day again, and everyone knows what that means: Time to remember your favorite draft suits. Back before the dress code, this was one of, if not the only times, to see your favorite players dressed to the nines. Better taste has prevailed in recent years unfortunately, and there're less laughs than in years past. 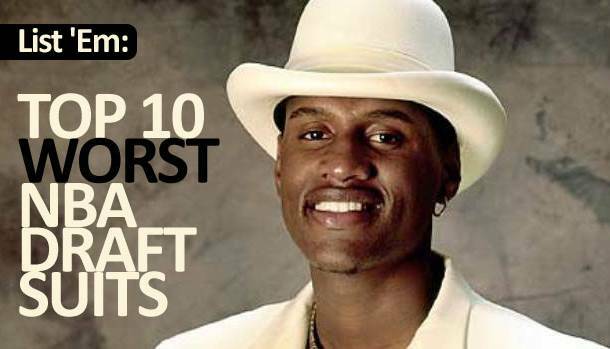 But what better occasion to take a look back at some of Draft Night's best outfits. What are your favorites? Any others that should have made our list? You tell us. 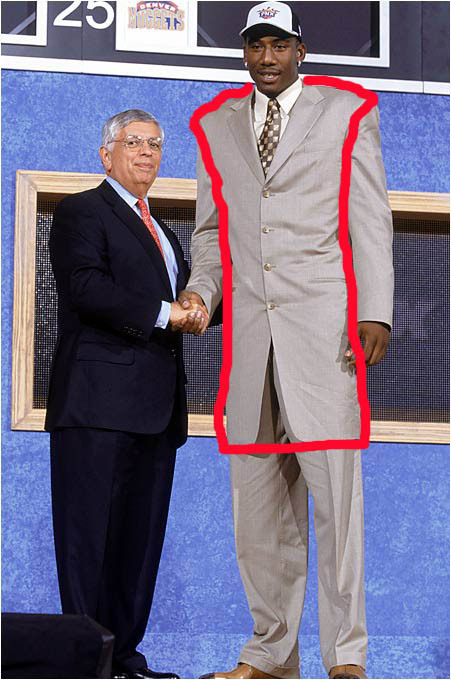 Does this look like the shape of a suit? 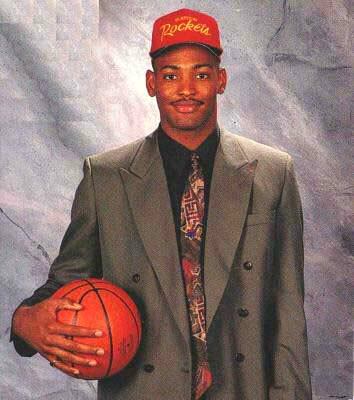 Name one guy that wore peak lapels with a tie from the Bill Cosby Sweater Collection on draft night, who DIDN'T win seven titles. It may not be a winning fashion formula, but it's hard to knock the results. Durasheen cap? Check. Tie juuuuust visible under jersey? Check. Bleached highlights? Check. Whatever Darko actually did right with his suit was quickly undone by over-accesorizing. It's easy to laugh at ill-fitting suits from days past. 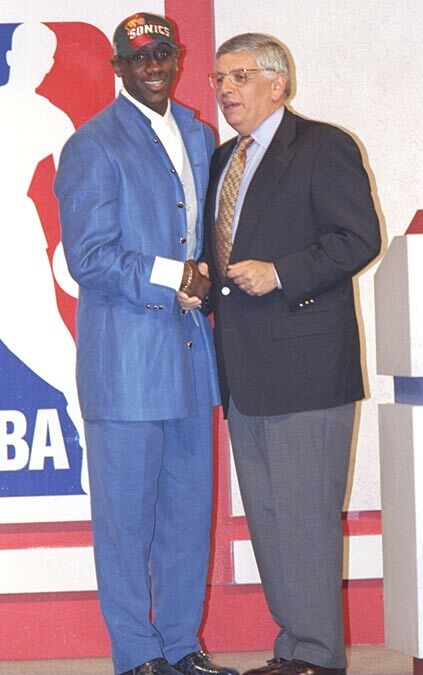 Granted, most of them looked bad at the time, but it's only fair to pay tribute to a modern interpretation of the "Draft Night Suit." Unlike most of the entrants on this list, Eric Gordon actually got the fit right. But he also managed to get just about everything else wrong. His lack of enthusiasm is understandable - he did just find out he'd be playing for Donald Sterling - but the width of his tie and white collar are not. 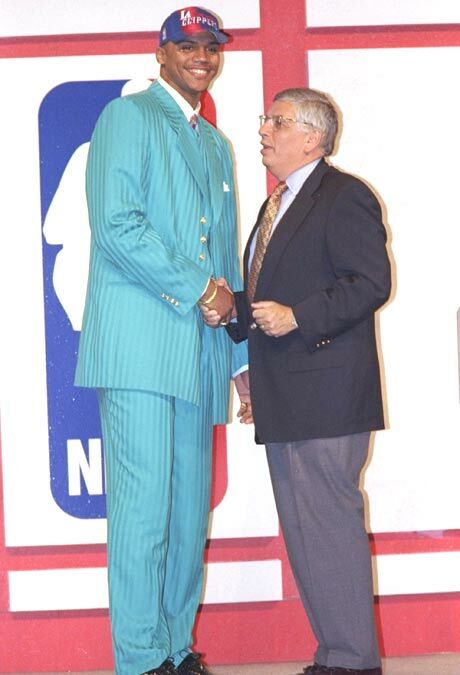 Unfortunately for Maurice Taylor, the Hornets had traded both of their picks in '97, leaving only the Vancouver Grizzlies for possible color coordination with this suit. 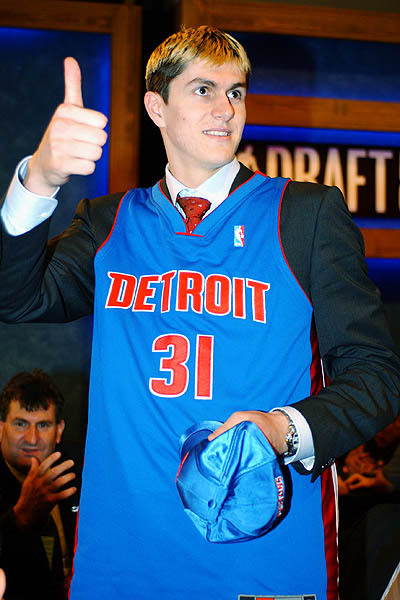 And while it may have looked good with a Vancouver hat, the Grizz had plans other than Taylor with the #4 pick. It was probably the right choice considering Antonio Daniels had a longer career, while Taylor, who fell to #14, has been out of the League for six years. 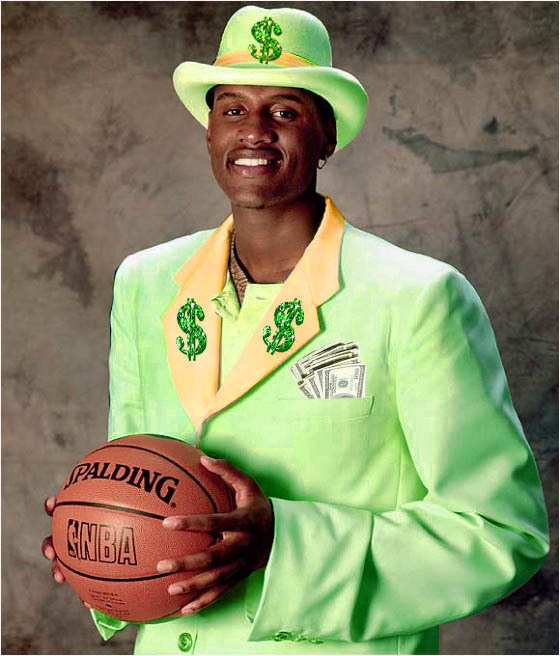 Samaki Walker's suit wasn't actually green and gold, but it sure lends itself to the Don "Magic" Juan-approved color scheme. There are those who say that no suit should ever have more than three buttons. Bobby Jackson is not among them. It's hard to say exactly why Jalen chose to go with an all-red suit for Draft night, but there's no doubt that it was the right choice. 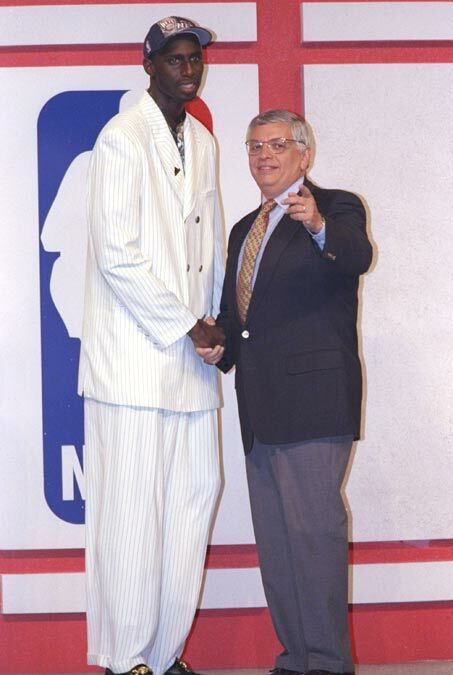 17 years later, it stands as one of the most iconic looks from Draft night. The fact that he picked the perfect tie helps too. Once upon a time (as in 2000), Tim Thomas took a car for a test drive ... and never returned it. 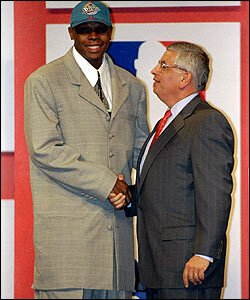 Hopefully he acquired this suit the same way, because based on the fit, there's no way he purchased it for himself. 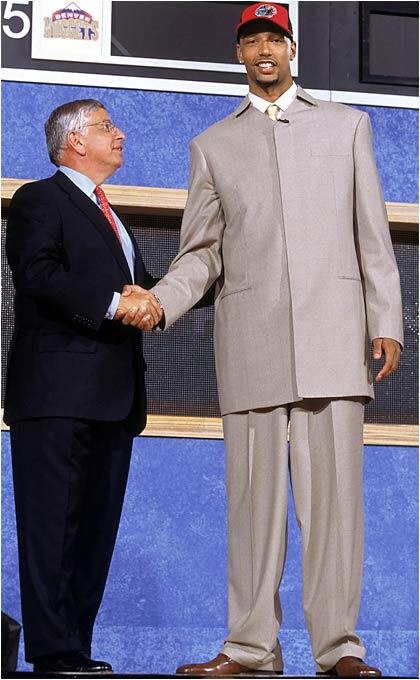 It's been exactly 11 years since Drew Gooden was drafted, and I still can't see this picture without literally laughing out loud. The length of the jacket screams "lab coat," and the number of buttons is left to your own imagination thanks to being hidden behind an expertly designed flap. Smart money would be on at least 15, but then again, there could even be a zipper back there. Only Drew and his tailor know for sure.